I exchanged the Wanderlust Diversity Bags for the Urbanite backpack today. I'll keep the tags on for a little while in the hopes that a cute print shows up but I am leaning towards the black. 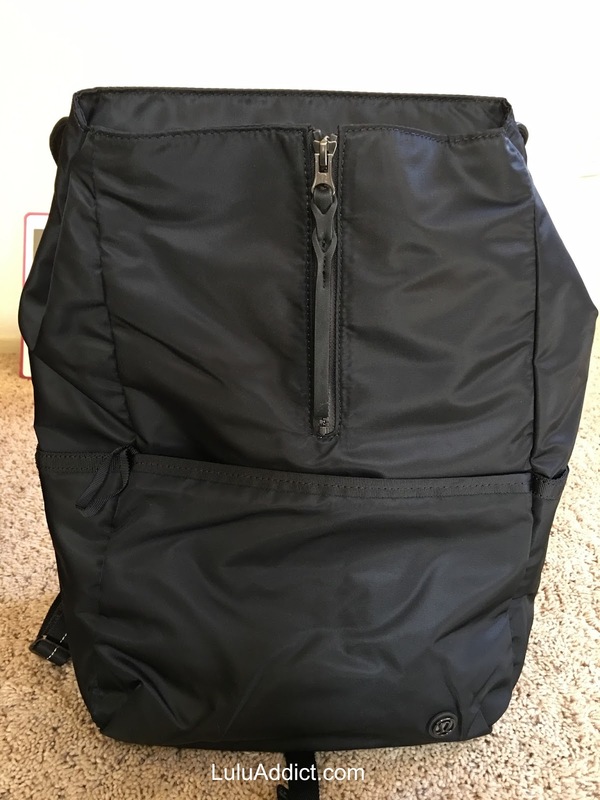 I did order a Run All Day backpack a few weeks ago but I ended up returning it because the back panel was a little stiff for how I wanted to use it, which was strictly as a casual bag. 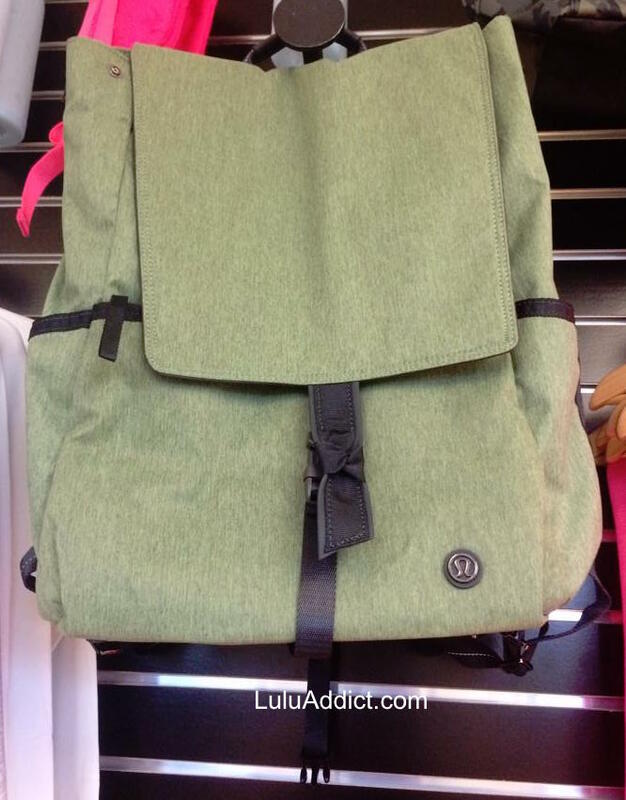 The Urbanite also comes in textured Desert Olive. 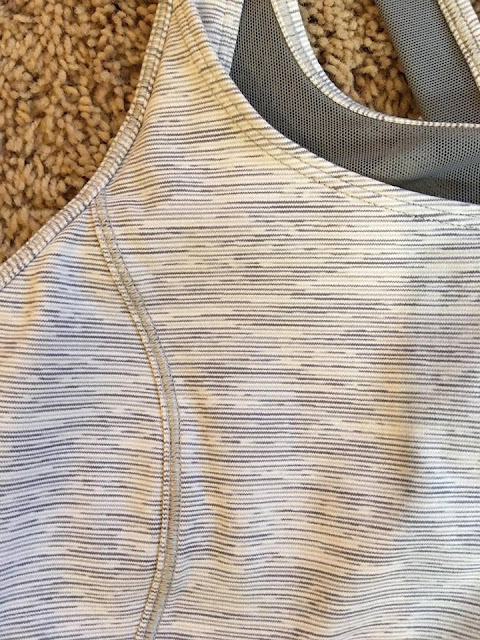 (Thanks to Ms. K. for her photo.) 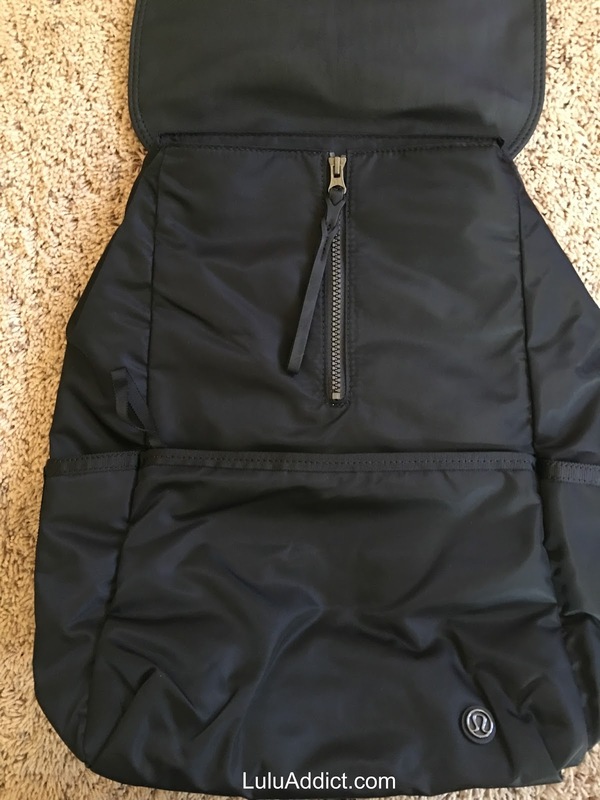 My store only has it in black. There are snaps on the sides at the top of the bag to give it a more triangular and modern shape. 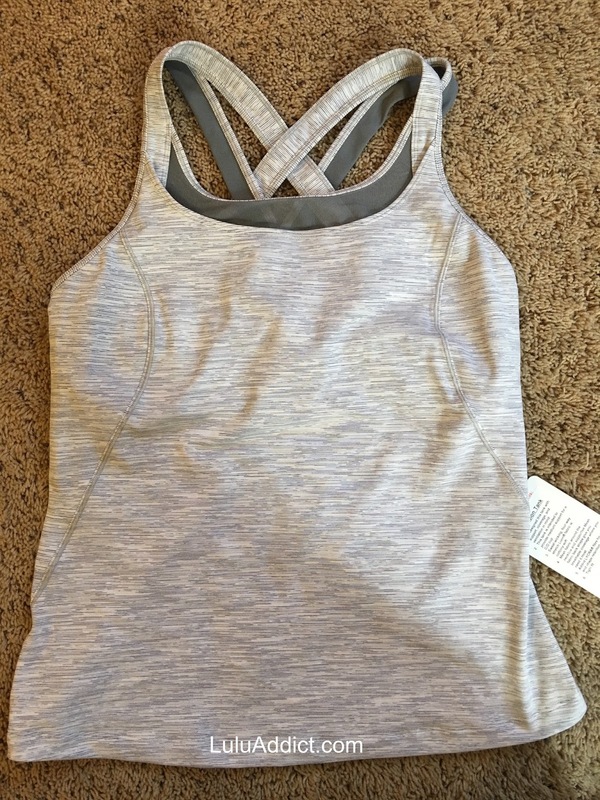 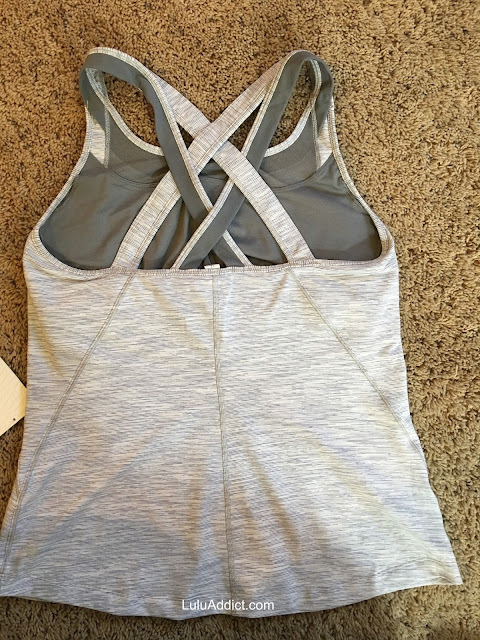 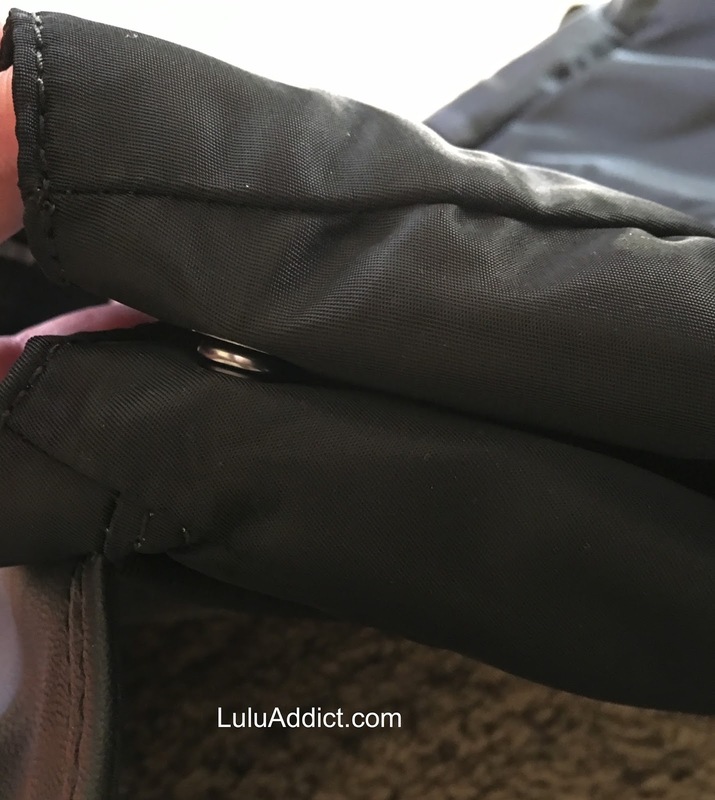 The top zipper helps with access when the snaps are done up. 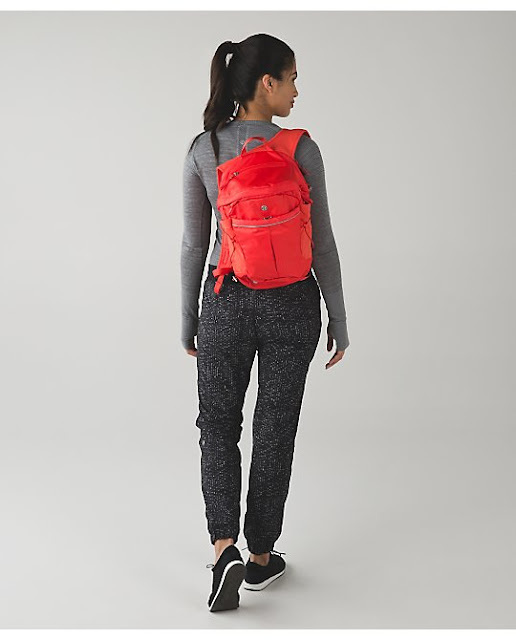 This backpack has a flat bottom so you can stand it upright. 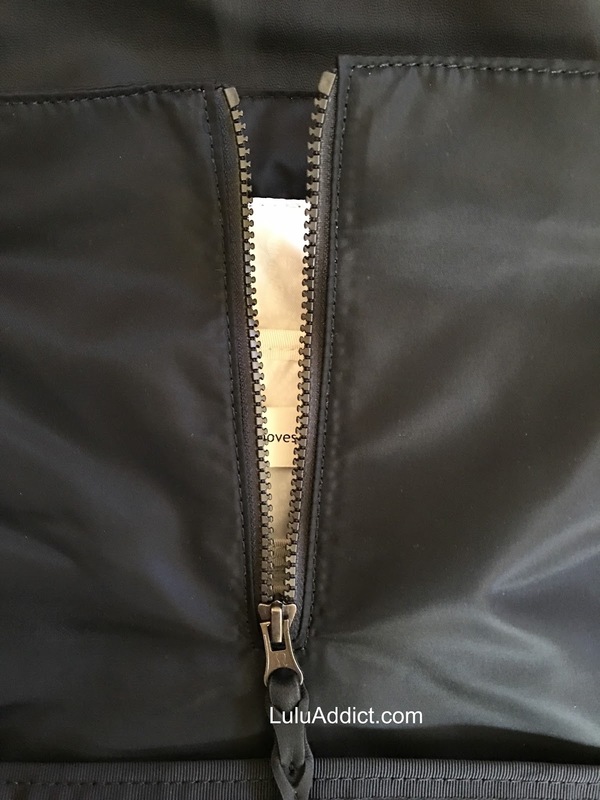 You can't do that with the Run All Day. The bottom on the Urbanite is made of a more durable, thicker pleather material. 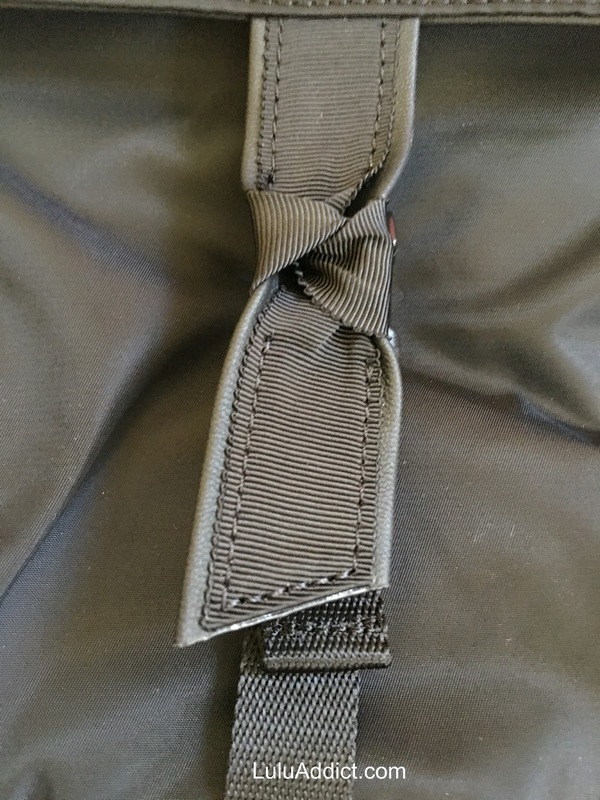 The front buckle closure is concealed by a decorative ribbon. 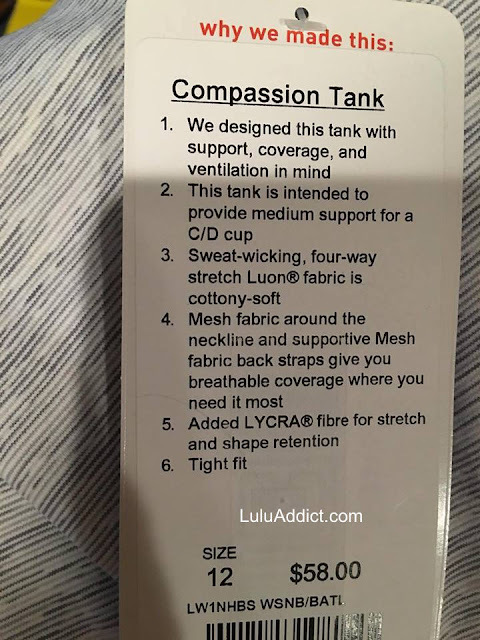 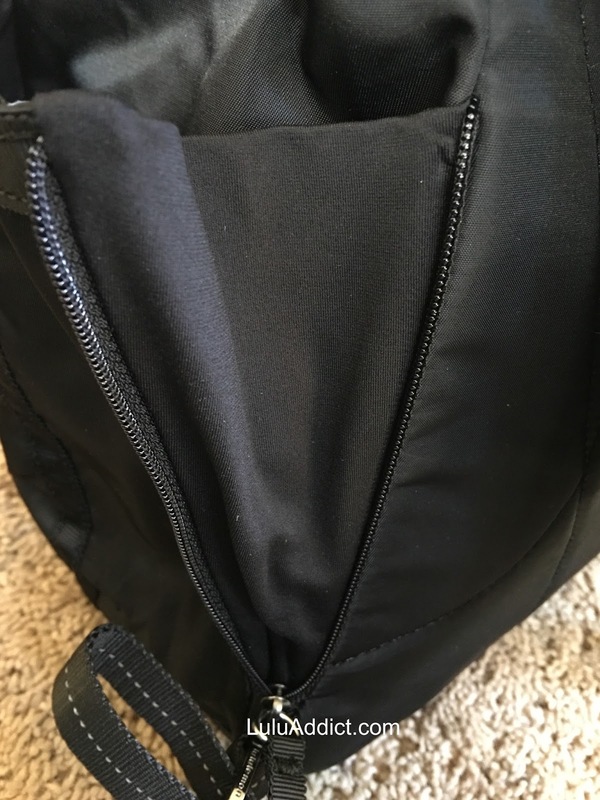 There is a large zippered front pocket with two smaller pockets, a flannel-lined one for sunglasses and one labeled for snacks. 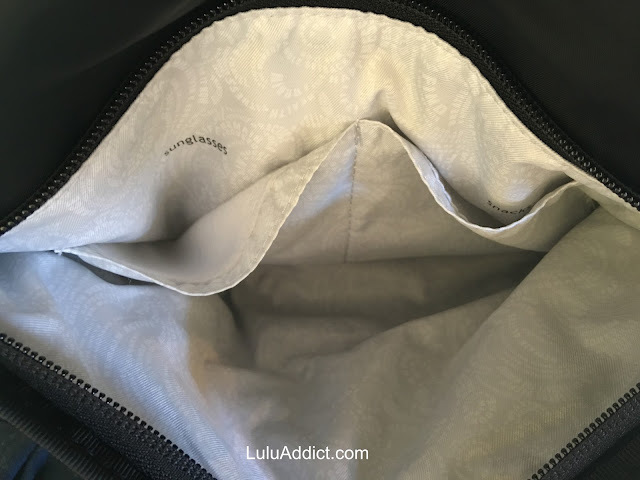 I can fit my bulky wallet in here. 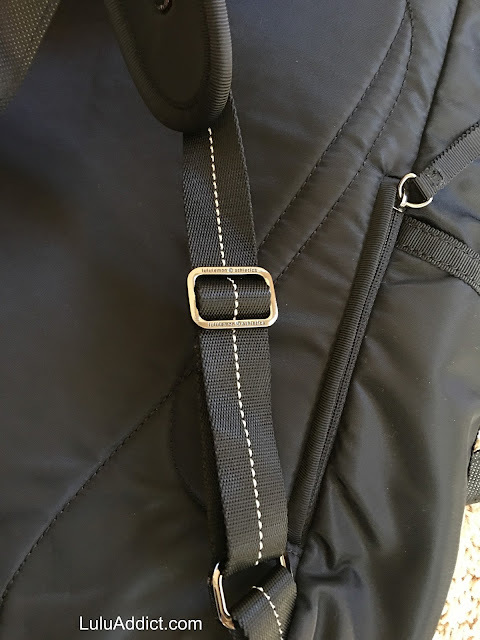 One of the side water bottle pockets has an expandable zipper. 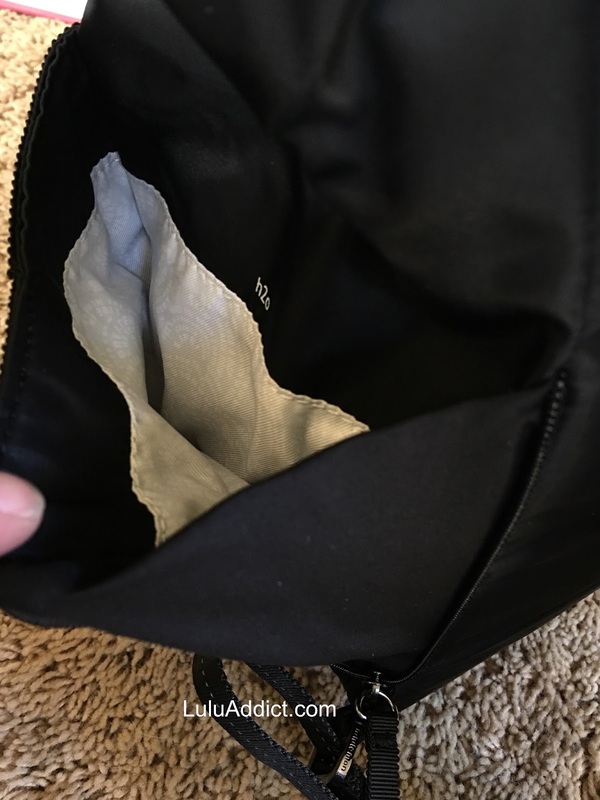 The other water bottle pocket. The phone pocket is behind the non-expandanding water bottle pocket and is very generously sized. 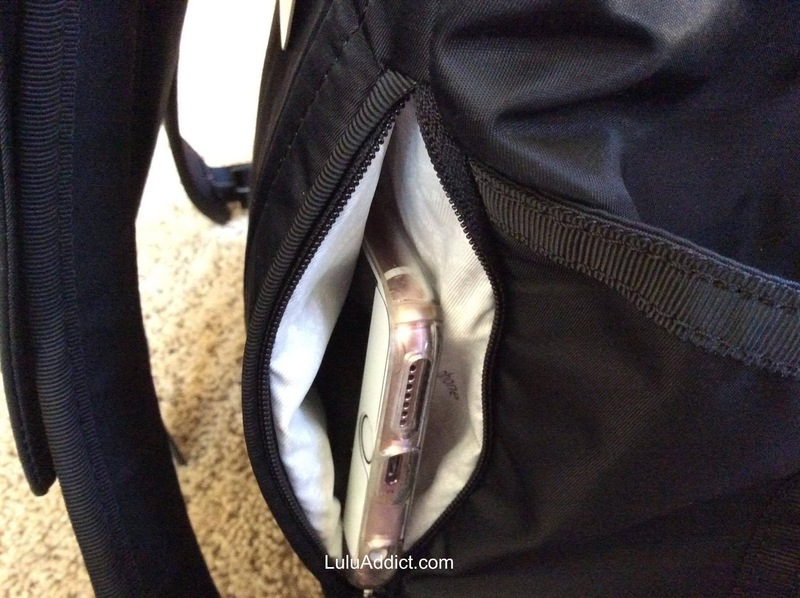 It easily fits my iPhone 6s+, unlike the phone pocket for the Run All Day backpack. 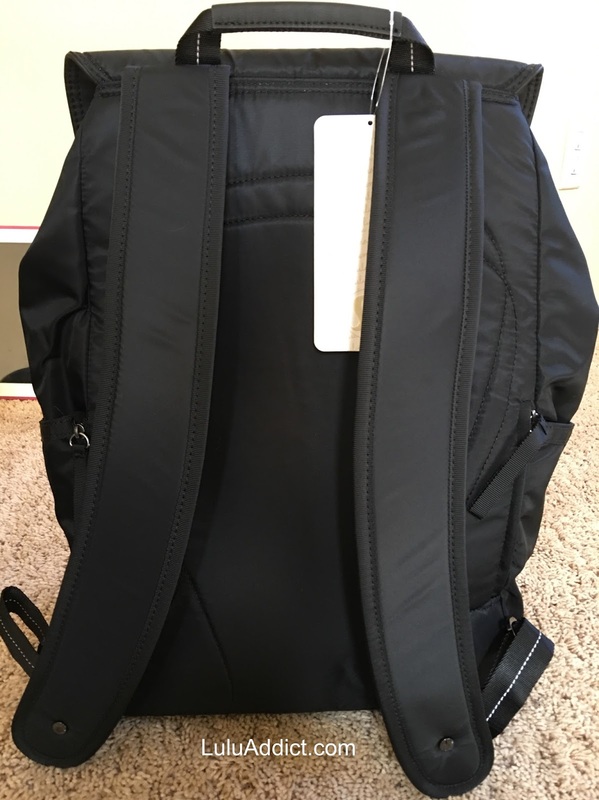 It was a struggle to get my phone in and out of that backpack. Looking inside the bag. 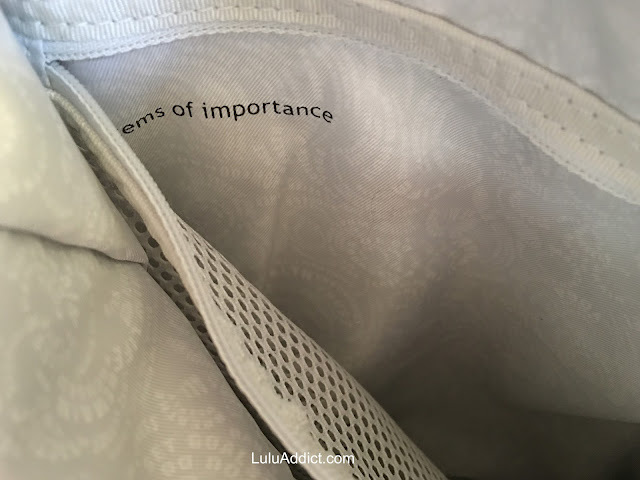 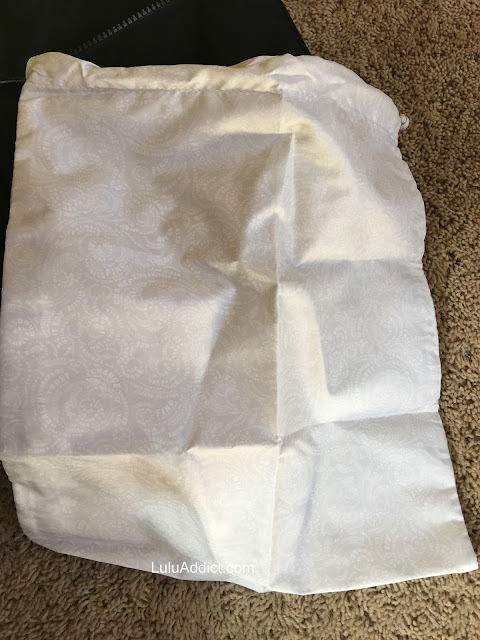 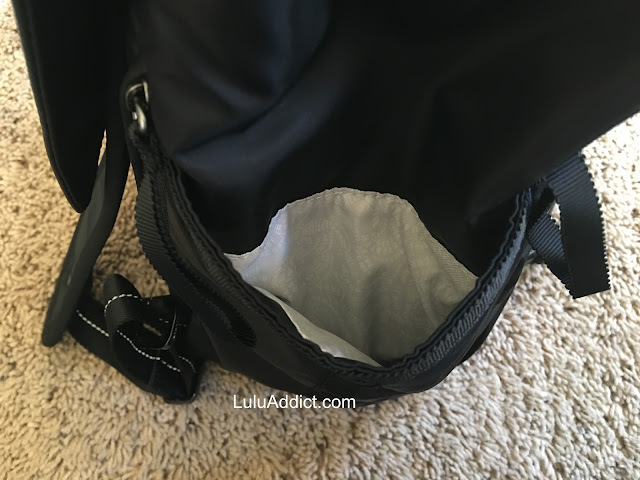 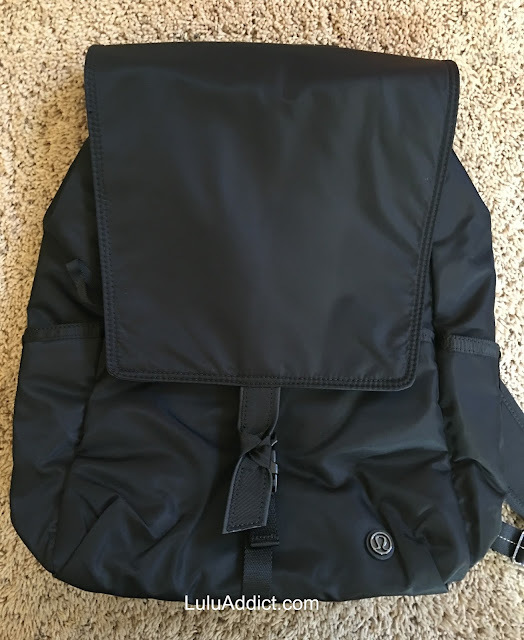 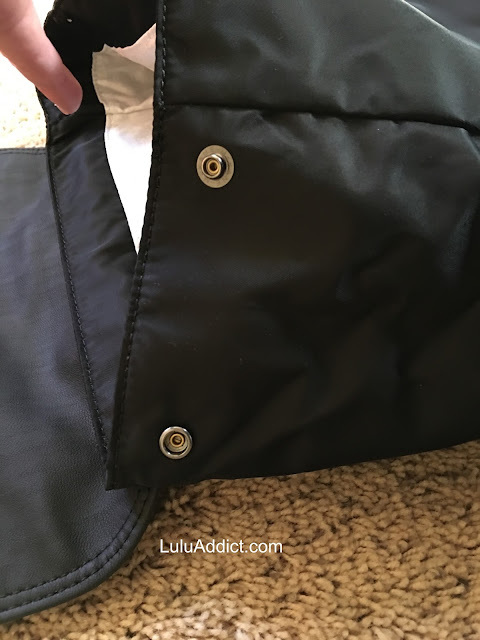 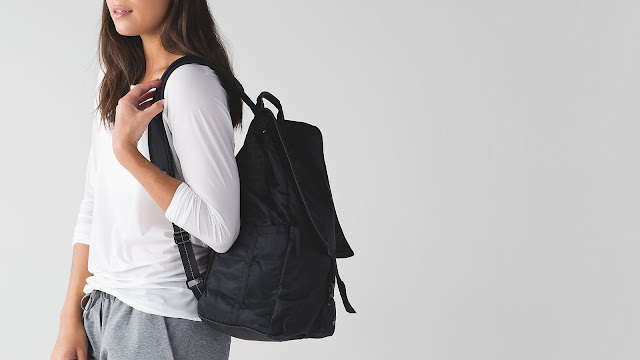 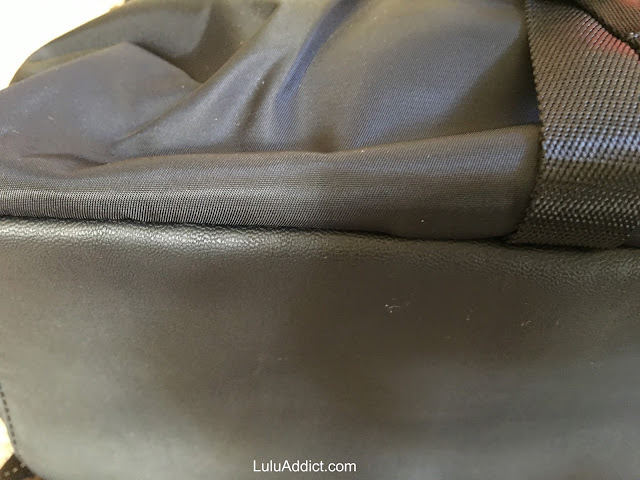 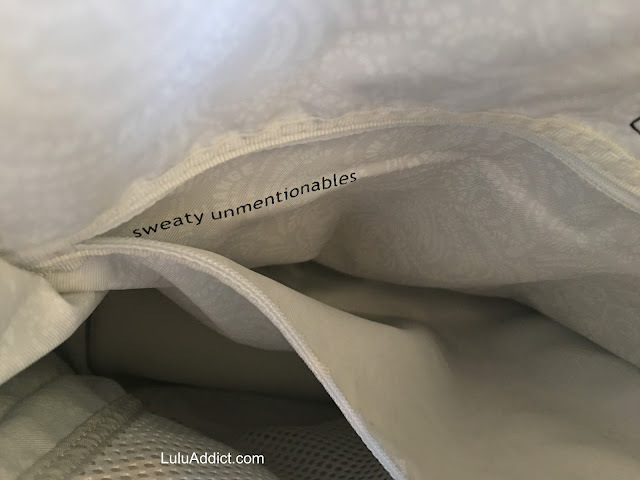 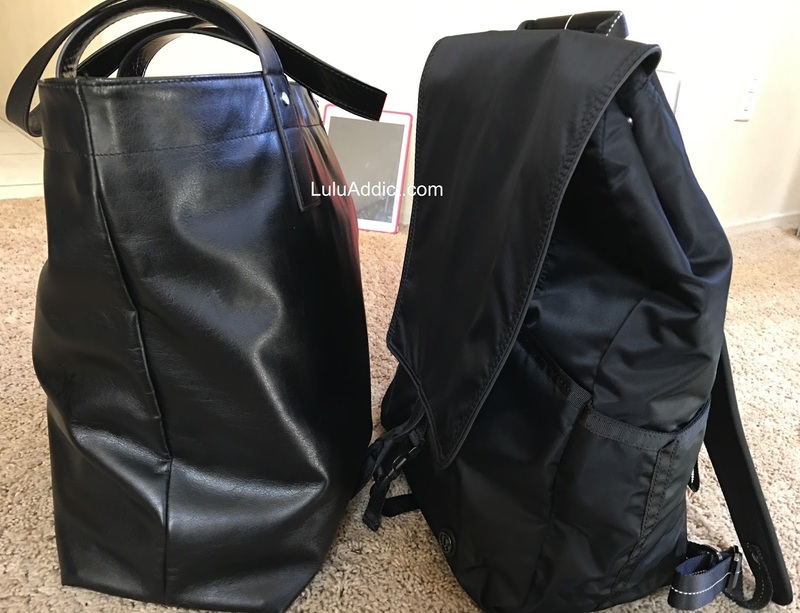 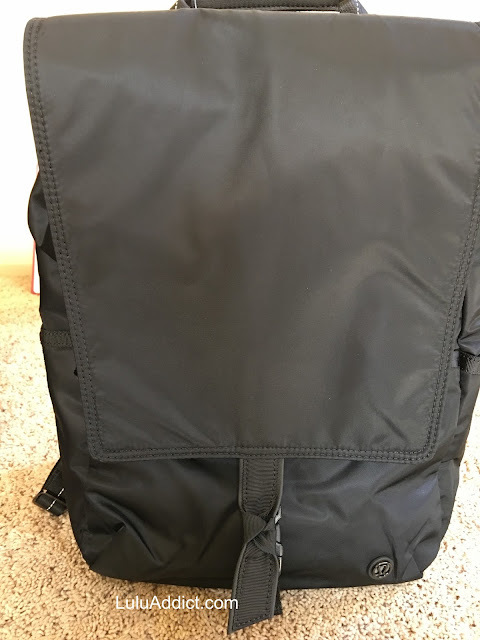 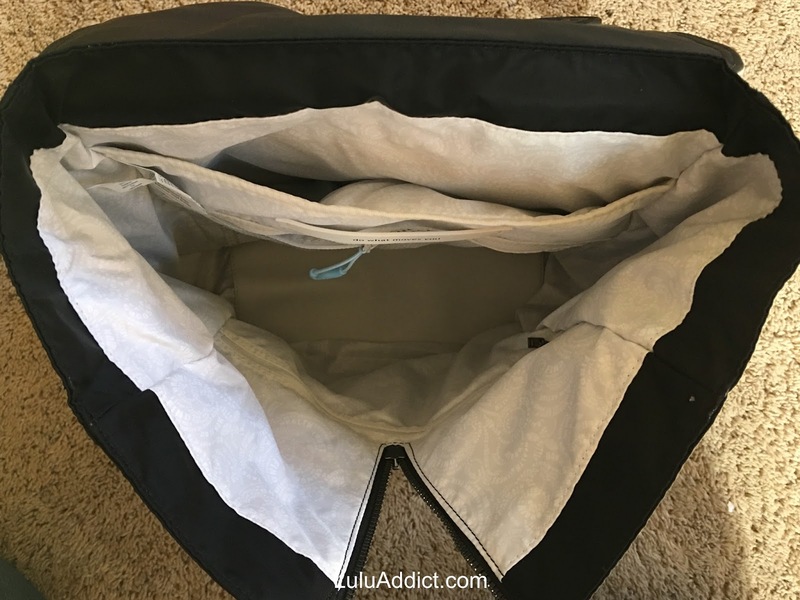 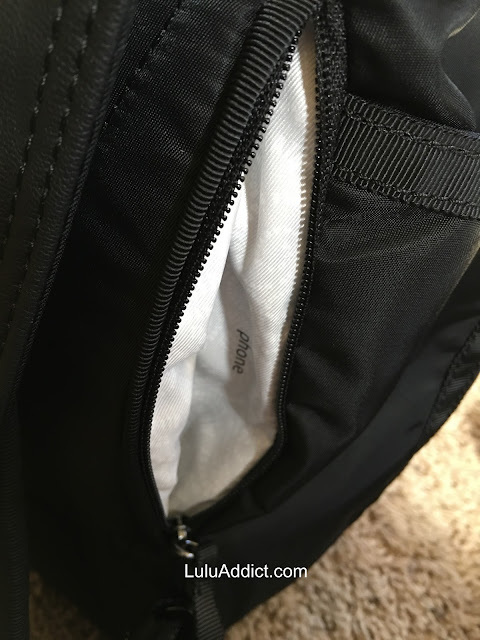 There is a padded laptop pocket, a large zippered mesh pocket in front of the laptop pocket, and a large zippered pocket for wet items along the front of the bag. 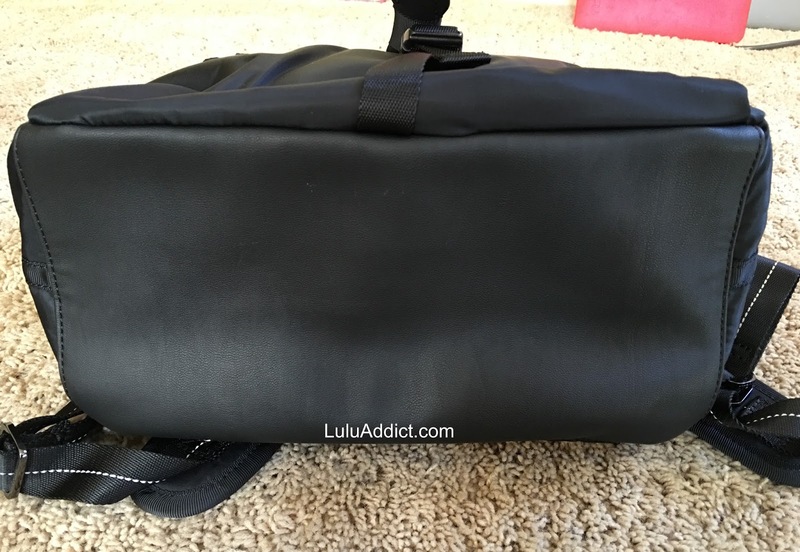 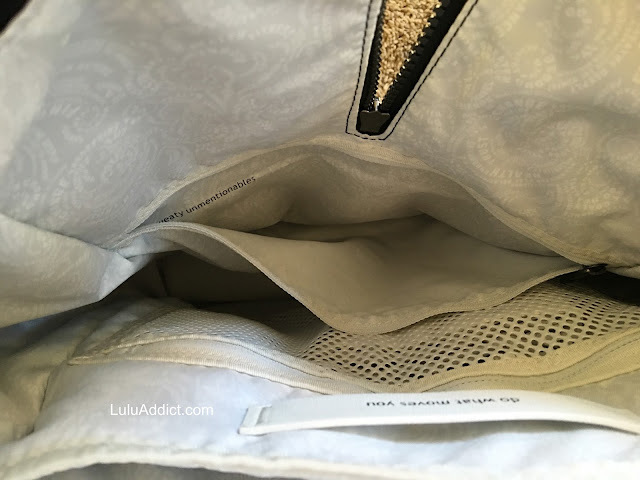 There is also a stuff sack/shoe bag, my favorite part of lulu bags. 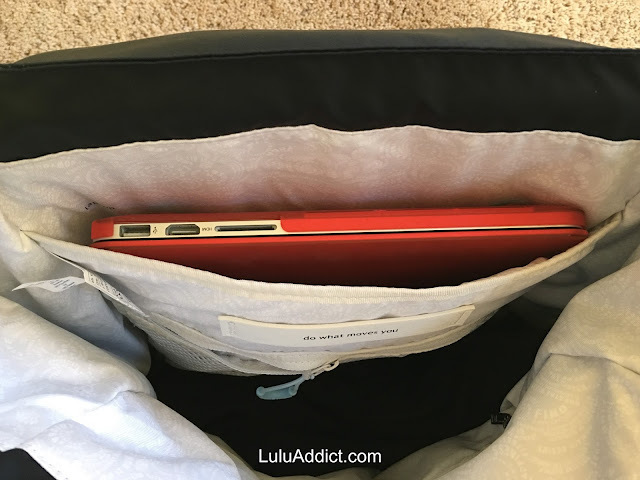 The padded laptop pocket is big enough for a 15" laptop. 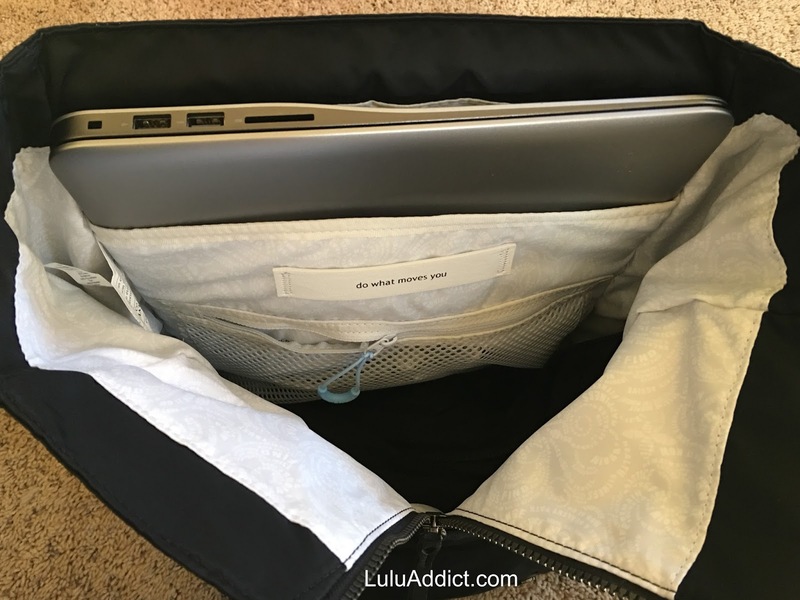 The Run All Day had a padded iPad pocket but could fit a laptop in the main compartment.. 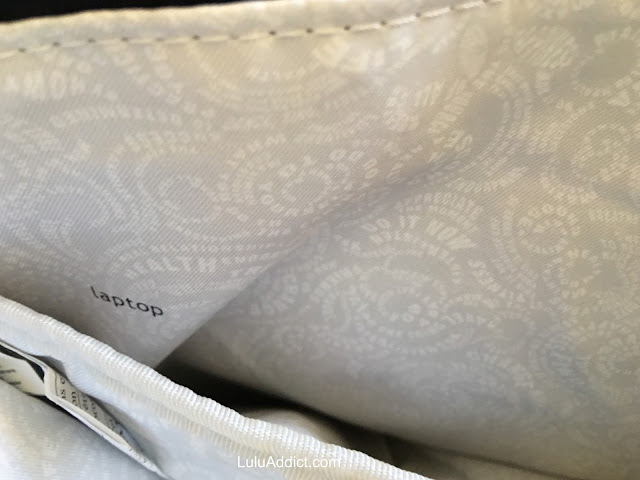 Laptop pocket with my husband's 15" laptop in it. 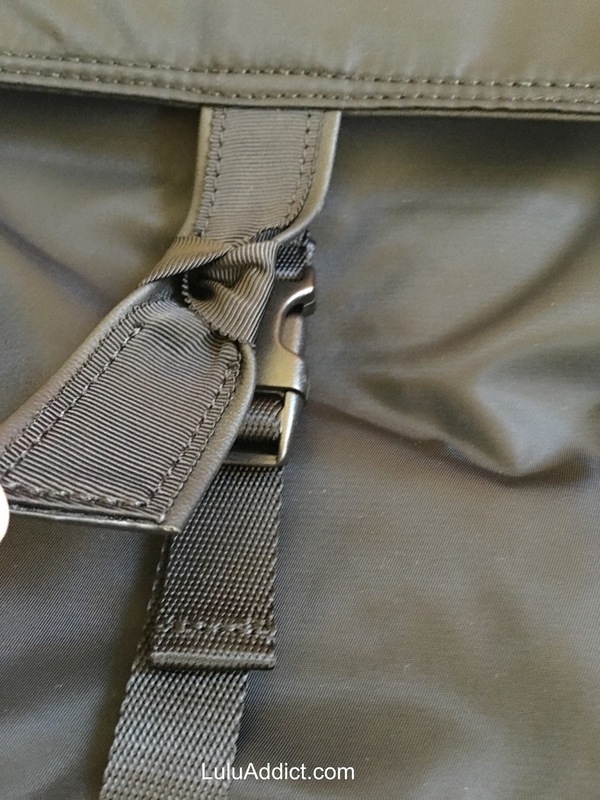 Laptop pocket with my 13" MacBook. Shoulder straps are continuous so no pieces to lose. 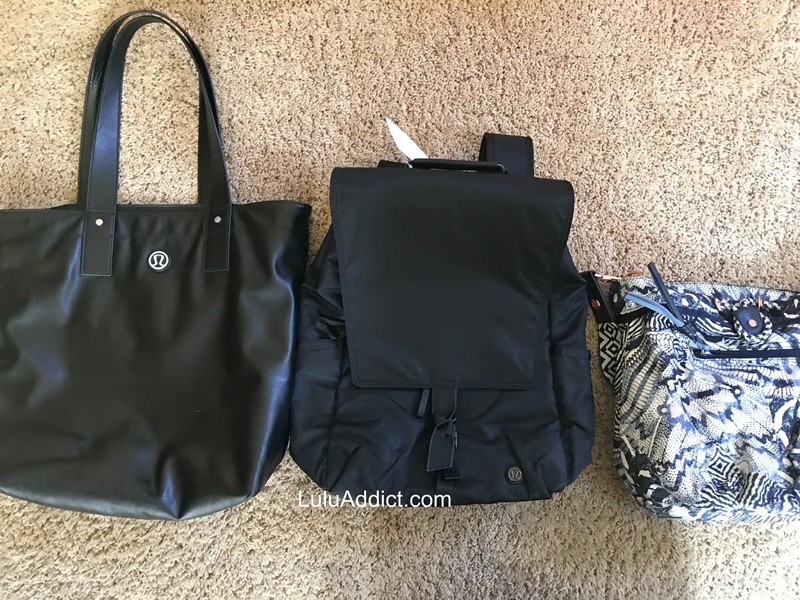 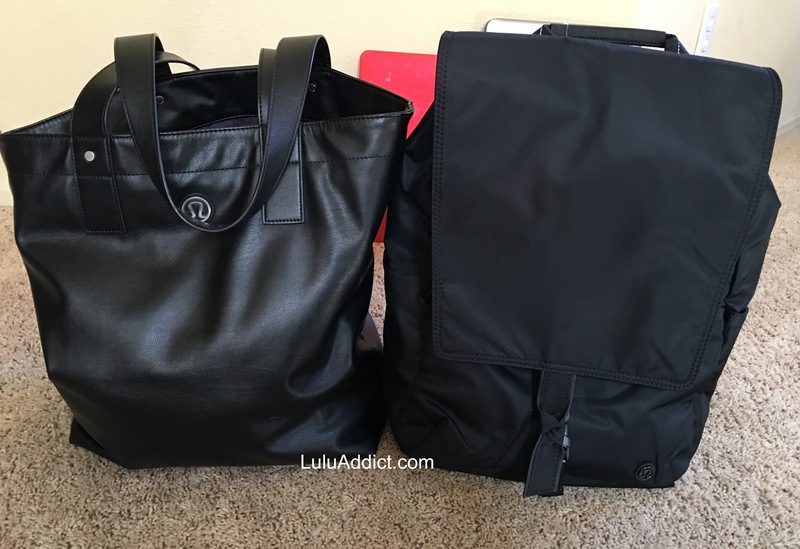 Size comparison to a Diversity bag and the Mantra Tote. 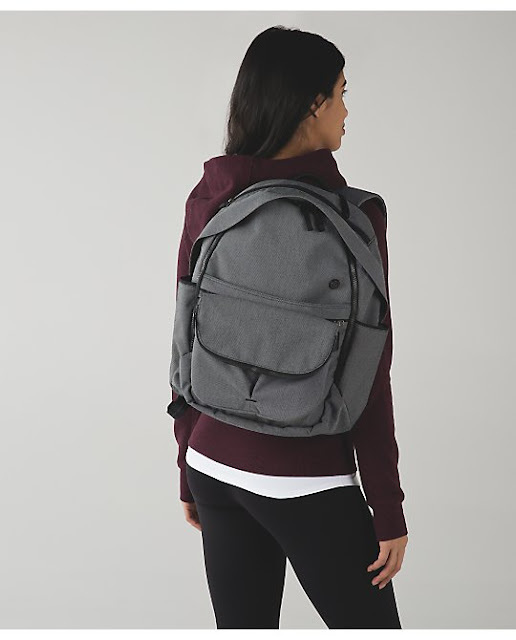 This is a pretty large backpack. 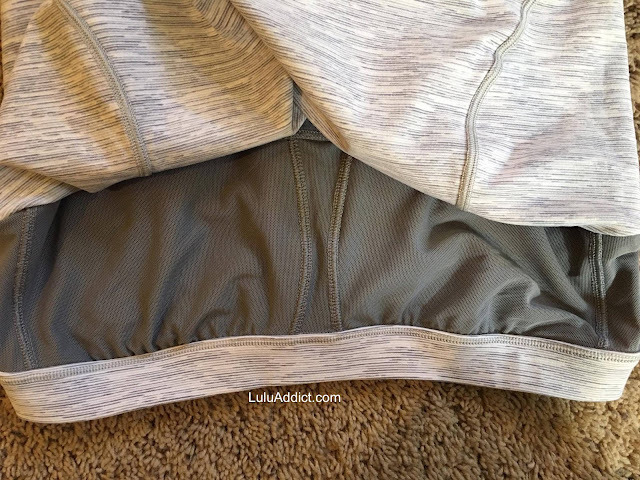 Ideally, I'd like something in between this and the Run All Day in size. 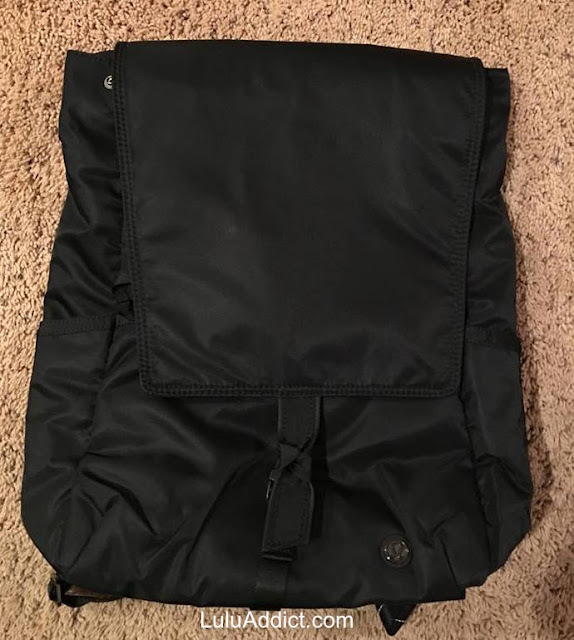 I definitely could press this into service as a gym bag. 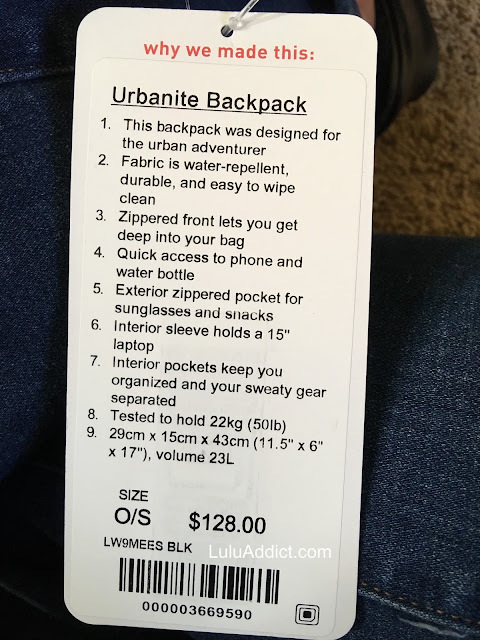 Urbanite Backpack, 11.5" x 6" 17"
All Day Backpack, 13" x 6" 18"
Around Town Backpack, 12" x 7" x 18"
Run All Day Backpack, 16.5" x 9.5" x 6"